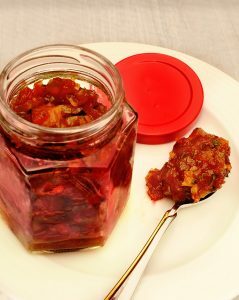 Tomato Apricot Ginger Chutney :: Oracibo.com - Food, Travel, Design and Cooking! Oracibo.com – Food, Travel, Design and Cooking! We love this chutney as an accompaniment to Indian spiced chicken. And it would be amazing with lamb and I have served it with Tourtiere at Christmas too! Chutney will keep for up to 1 week in the fridge or you can process it as you would for jam. It will keep or a few months in the freezer. Place all ingredients, except the cilantro, in a large pot. Cook over medium to medium-low heart until the liquid just evaporates, stirring frequently, approximately 30 minutes. Transfer to a bowl & cool completely, add the chopped cilantro & serve or store in the fridge or place in jars and can following proper canning guidelines.